As the fall season kicks into overdrive during the month of October, I like to head into my kitchen to bake some homemade pumpkin flavored items. 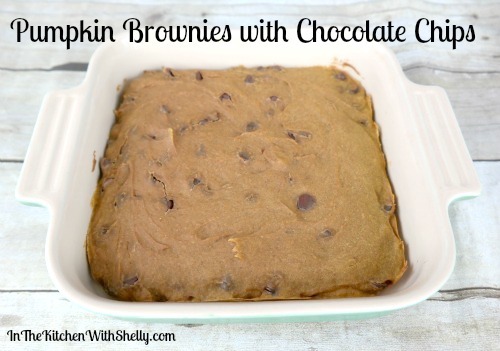 We enjoy pumpkin cookies, cakes, muffins and of course...brownies! I recently found this Pumpkin Brownies with Chocolate Chips Recipe over on the Very Best Baking website and I knew immediately that I had to give it a try. You can go to their website and print out the recipe yourself. The only changes I made to their original recipe was the chocolate chips. Their recipe calls for 1/3 cup and I added a 1/2 cup as I like a lot of chocolate chips! In addition, instead of using semi-sweet morsels...I like using milk chocolate chips. Just my own personal preference on that! Over all, we give this recipe 10 raving stars! I actually made a batch and then 9 hours later, made a second batch as my family just loved them. They are a super moist and chewy brownie with just enough chocolate added to them. I think you all will love them too! Well look at that! I bet it smelled wonderful too. Can you come pick me up in your Tupperware private jet? This sounds like something I would love. Wonder how it would taste if I made it gluten free with spelt or some kind of mixed gluten free blend instead of wheat flour. These look so delicious. I love the mixture of chocolate chips and pumpkin!! Thanks for sharing.